Iranian report says IAF jets at US base in Iraq are preparing for an attack inside Iran. US, Iraq, Israel say the report is bogus. 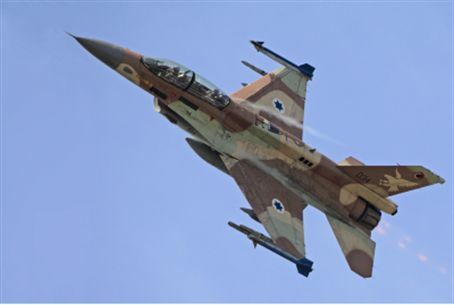 Israeli jet fighters have been conducting drills at an American military base in Iraq, ahead of a strike against targets inside Iran, Iran's PressTV reported Monday. Israel flatly denied the report, according to news agencies. So have the U.S. and Iraq. The PressTV report quoted sources close to Iraqi cleric Muqtada al-Sadr's group as saying "a considerable number of Israeli warplanes were seen at al-Assad base in Iraq." The aircraft reportedly included F-15, F-16, F-18 and F-22 jet fighters, as well as KC-10 air-to-air tanker aircraft. The very mention of the F-18 and F-22 models casts doubts on the veracity of the report, since the IAF does not possess these models. Moreover, the American F-22 has yet to take part in U.S. combat sorties and its export is banned. The warplanes carried out week-long exercises at night, the same source told the Iranian journalists. "The drills were reportedly aimed at preparing to strike Iran's air defense systems, disrupt Iran's radar and attack targets deep inside Iran." "Iraqi officials had not been notified of the exercises, which were conducted in collaboration with the US military," the agency claimed.